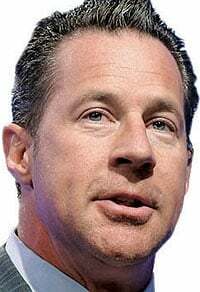 FCA's Reid Bigland in the midst of controversy. Auto-sales reporting is under the regulatory micro-scope and the result could be a major overhaul of the way car companies report transactions. The most extreme outcome of U.S.-led investigations into Fiat Chrysler Automobiles (FCA) and U.S. sales chief Reid Bigland could be an end to the monthly sales reports that are unique to the car business and much watched by industry players, stock analysts and the media. More likely, however, is stricter oversight of the way sales are measured during the often-complicated handoff from manufacturer to dealer to customer. “At some point, some-body needs to step in and set some boundaries,” says Dennis DesRosiers, president of DesRosiers Automotive Consultants and Canada’s best-known automotive number cruncher. Manufacturers and dealers have a full tool-box of options for boost-ing sales figures, from discounted fleet sales to setting high residual values on leases to lure customers with low month-ly payments. Most, says DesRosiers, fall into a “grey area” with limited impact beyond the down-the-road hit on automaker and retailer profits. But others, such as manufacturer programs that tie dealer incentives to ever-increasing sales quotas, “can lead to some very abhorrent behaviour” in which truckloads of new vehicles arrive at dealerships and are immediately declared sold. FCA, which in July 2016 revised years of figures to showthat a much-touted U.S. sales-growth streak ended in 2013 rather than 2016, has already moved to exclude sales that are later cancelled by the customer (“unwound,” in industry jargon) as well as an arcane, “not-in-use reserve” fleet-sale category it says it inherited from the former Chrysler Corp. The company has refused to comment on reports by the Bloomberg news service on the criminal and regulatory investigations into whether FCA fraudulently hyped its sales totals. It decided against the move because of concerns about how the automotive press would react. A Canadian authority on business sustainability believes the focus on results every four weeks discourages the type of planning needed for long-term growth, or even survival. “I think companies are just in this trap of going faster and faster on this treadmill, trying to outcompete each other in small ways,” says Tima Bansal of the Ivey Business School at the University of Western Ontario. She points to Coca-Cola and Pepsi battling for market share while failing to prepare for an overall decline in demand for soft drinks. DesRosiers, however, believes automakers are unlikely to abandon their monthly public sales statements and even more frequent internal reports in a world ever more focused on timely information. Others say they rely on car sales as a key measure of overall economic health. Gomes says hard sales data helped him forecast continued strong automotive demand in North America earlier this year, even as others raised fears of a global economic slowdown. Statistics Canada also views the figures as an economic bellwether, says Michael Hatch, chief economist for the Canadian Automobile Dealers Association (CADA). The federal agency charts monthly new-vehicle sales in a detailed report that comes out one month after automakers release their figures. At the company level, the value could be in bragging rights. “It’s things they can say in their advertising, you know, we’re No. 1, or we’re fastest growing, or we’re best in market share,” says marketing professor Alan McGee of the Automotive Business School of Canada at Georgian College in Barrie, Ont. The former manufacturer’s representative knows first-hand the pressure the car companies put on retailers. McGee doesn’t dispute that automakers and dealers might be tempted to boost numbers to edge out competitors or win sales contests. But doing so, he says, poses big risks: friction with the companies that finance dealer inventory, warranty issues on cars registered as sold but not delivered, even fraud prosecution.